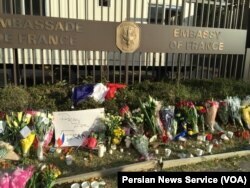 A memorial to victims of the coordinated terrorist attacks in Paris Friday grows outside the French Embassy in Washington, D.C., Nov. 14, 2015. Americans have joined the global chorus of voices condemning the terrorist attacks in Paris, offering condolences to the victims' families and expressing solidarity with the French people. The State Department said Americans were among the wounded, but the number wasn't known. California State University in Long Beach confirmed Saturday that one of its students, Nohemi Gonzalez, had been killed. She was shot in one of the restaurants that was targeted. The school gave no details about how she died. Gonzalez was studying design in France. The Saturday matinee performance and radio broadcast of New York's Metropolitan Opera began with the chorus and audience singing "La Marseillaise," the French national anthem. The speaker of the U.S. House of Representatives, Paul Ryan, said Americans are "united and unbowed" in their support for the French people. "It will take time to grasp the scale of this horror," Ryan said in a statement, "but there is one thing we already know: Terror will not prevail. We will." House Foreign Affairs Committee Chairman Ed Royce said his thoughts and prayers were with all affected by the "horrific" attacks in Paris, the worst terrorist incident in Europe in years. "France has been among our closest allies in combating terrorism," Royce said in a statement. "...The people of France stand on the front lines in the fight against a dangerous and growing jihadist ideology that knows no bounds." Clinton, the Democratic front-runner, said details of what happened in Paris were "harrowing." Democrat Martin O'Malley urged people to "turn deaf ears to hatred" and be their best in the face of terrorism. "These savage and despicable attacks on civilians, whether they occur in Paris, Beirut or any other city, are outrageous and without justification," CAIR said. "We condemn these horrific crimes in the strongest terms possible. Our thoughts and prayers are with the loved ones of those killed and injured and with all of France. The perpetrators of these heinous attacks must be apprehended and brought to justice." The Ahmadiyya Muslim Community, one of the oldest Muslim organizations in the U.S., said the attacks were directed at "all of humanity" and did not reflect the beliefs of the Prophet Muhammad. 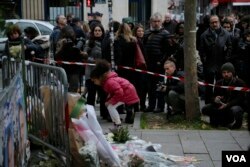 A small girl lays flowers as part of a memorial to victims a day after more than 120 people were killed in a series of attacks in Paris, Nov. 14, 2015. "Islam teaches in the Quran that the killing of an innocent is like the killing of all mankind," the group said in a statement. "Prophet Muhammad was a noble, kind and patient man who protected the lives of all, regardless of religion, and did not engage in such terrorist attacks." Laurie Beth Jones, an author of Christian books, posted under the Twitter hashtag Prayers4Paris: "So sad about Paris attacks. May the City of Lights outshine all the darkness." The organization Godless Utopia, which calls for "a perfect world with no religion," posted on Twitter and Facebook: "Don't pray for Paris. Fight against hateful, oppressive religious ideology." Biff Rothschild tweeted: "I wonder who's responsible for the #Paris attacks. What do you think? Muslims, Muslims."